Los Angeles is slowly but surely working its way towards being one of the most bike-friendly cities in then country by laying down a comprehensive network of bike lanes throughout the city. And this cute pint-sized street sweeper employed by the city makes sure they’re kept free of debris. Awwwwww. 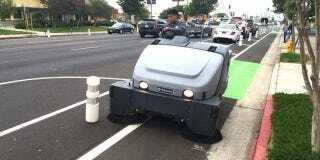 The mini street sweeper makes the rounds to several destinations in the city featuring bike-only infrastructure. It made its most recent appearance on the brand-new protected bike lanes on Reseda Boulevard, one of the first bike lanes in the city to be fully separated from vehicular traffic. With several more of these protected lanes in the works, the city might have to bring on a second small sweeper very soon.